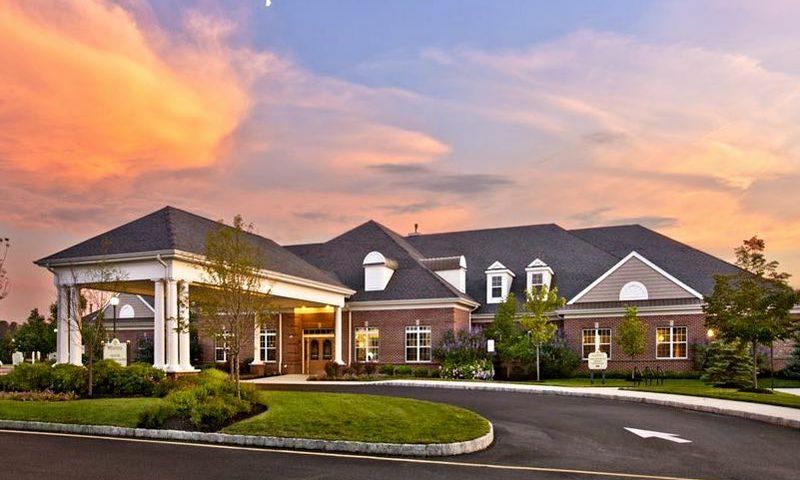 The 18,400 square-foot clubhouse located in the heart of Equestra at Colts Neck Crossing includes many amenities to keep residents healthy and active. Residents can stay in shape with the state-of-the-art fitness center and indoor pool. Those who like to socialize will appreciate the card room, billiards room, arts and crafts studio, and Paddock Club Bar and Lounge. There are also computers, a library and a ballroom. Outside, residents can enjoy some friendly competition on the tennis courts, bocce ball courts, shuffleboard court, and horseshoe pits. The outdoor pool and patio with a grill is the perfect place for happy hours or pool parties. Equestra at Colts Neck Crossing also offers a putting green so golfers can practice their short game. There is even a playground for when the grandchildren visit. Equestra at Colts Neck Crossing also has a zen garden, gazebo and walking and biking trails. Centex started building Equestra at Colts Neck Crossing in 2007. This scenic community, when completed, will be comprised of a total of 483 single-family homes. Buyers can currently select from both new construction and resale homes. There are nine different innovative home designs to choose from which include one and two-story floor plans ranging in size from 1,453 to 2,651 square feet featuring two to four bedrooms with one-and-a-half to three bathrooms, and offer two or two-and-a-half-car garages along with innovative expansion options. Residents of this active tight-knit community are extremely friendly and while the neighborhood is established, newcomers are welcomed with enthusiasm. Equestra at Colts Neck Crossing offers a long list of outdoor activities in addition to the outdoor pool. There are walking and biking trails, tennis facilities, bocce ball courts, shuffleboard and even a playground on the premises. A full-time activities director is on hand to help keep the activity calendar full and organized. Some popular activities and clubs include book club, bridge, chess, fishing club, happy hour, travel group, and singles club. Homeowners can also stay in terrific shape with Jazzercise, walking club, or yoga. They can also pick up a new skill with the knitters or crafters club. However you choose to spend your time, Equestrian at Colt's Neck Crossing will have something for you. Equestra at Colts Neck Crossing is located in Farmingdale, New Jersey. Residents of Equestra at Colts Neck Crossing have plenty of opportunities for shopping, dining and cultural enjoyment. Homeowners have easy access to public transportation. Monmouth County has numerous antique shops, arts and crafts stores, department stores, flea markets and malls. Freehold Raceway Mall is only ten minutes away, while Monmouth Mall, which is New Jersey's fifth largest mall, is only 20 minutes away. Asbury Park is only 25 minutes away. The boardwalk at Asbury Park still hosts popular music acts. There is also a pavilion and a pier for fishing or just enjoying the beautiful views. Gateway National Recreation Area and Sandy Hook Gateway Recreation Area are only 45 minutes away. Sandy Hook Gateway Recreation Area offers miles of beaches and dune trails, surf fishing, Sandy Hook Lighthouse and over 300 species of birds for bird lovers to enjoy. Equestra at Colts Neck Crossing is just minutes from Interstate 95, 195 and the Garden State Parkway. A 45-minute drive will take you to vibrant Atlantic City and for the active long distance traveler, Newark Liberty International Airport is only 45 minutes away and Atlantic City International Airport is 75 minutes. If you prefer scenic travel by train, the Amtrak Station is only 40 minutes away. Equestra at Colts Neck Crossing is an ideal active adult community in Monmouth County, New Jersey. Clubhouse - 18,400 Sq. Ft. There are plenty of activities available in Equestra at Colts Neck Crossing. Here is a sample of some of the clubs, activities and classes offered here. There are a variety of single-family homes available on a new and resale basis. Homes range from 1,453 to 2,651 square feet and feature two to four bedrooms, one-and-a-half to three bathrooms and a a two or two-and-a-half car garage. Stunning Clubhouse! Beautiful outdoor area for gathering with friends and enjoying a peaceful walk around the pond. Home are gorgeous! Best part is convenient access to all the shore hotspots as well as the Freehold mall. Our small community is really popular around town. It's well known as a very nice neighborhood and really feels like living in a country club, just without the golf. I'm not worried about our resale value here. The location is great plus everything you get here is top-notch. 55places.com is not affiliated with the developer(s) or homeowners association of Equestra at Colts Neck Crossing. The information you submit is distributed to a 55places.com Partner Agent, who is a licensed real estate agent. The information regarding Equestra at Colts Neck Crossing has not been verified or approved by the developer or homeowners association. Please verify all information prior to purchasing. 55places.com is not responsible for any errors regarding the information displayed on this website.